(Byfield) There was nothing St. Paul’s School could do about Joe Kuo. 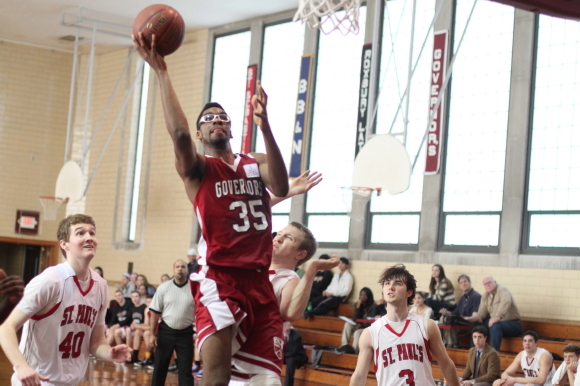 The Governor’s Academy 6-9 senior poured thirty-eight points down on St. Paul’s (Concord NH) and led the Govs to a, 66-50, win on Wednesday afternoon in Independent School League action. GA (10-7) led by only two points (29-27) at halftime but erupted with a 16-2 stretch to start the second half and never looked back. 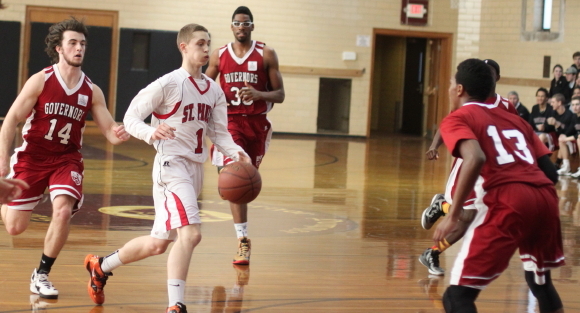 In the early going St. Paul’s (4-13) had enough offense to stay with GA despite Joe Kuo. Ethan Schlager (16 points) and David Smith (11 points) made three’s and Jared Neves (15 points) ran seven points in a row by himself. This collection of offense was part of an attack that put Big Red in front, 23-18, with 3:42 left in the first half. 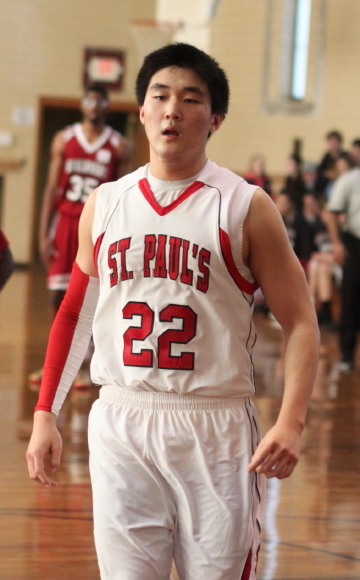 The next 2 ½ minutes the steady flow of Joe Kuo points kept coming (9 points) but there were no St. Paul’s answers. 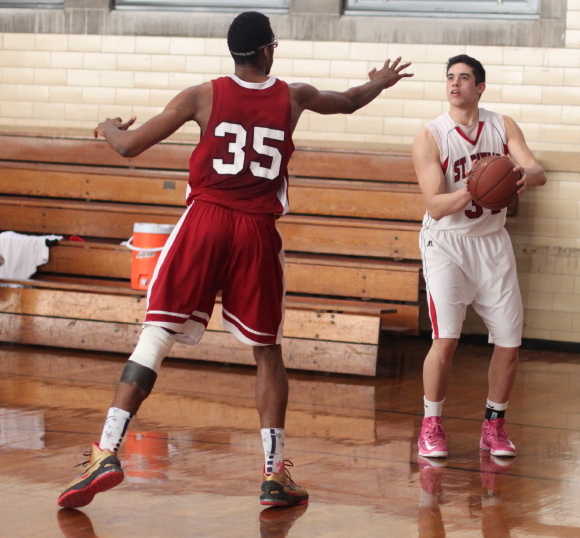 Cam Nobles added two free throws and the Govs had an eleven-point run and the lead (29-23) with 1:25 until halftime. Two free throws by Jackson Gates (8 points) and a layup in heavy traffic narrowed the Govs lead to, 29-27, at halftime. Who knows what went on in the GA locker-room at halftime but they came out flying in the second half. In the first five minutes of the second half the visitors had only a David Smith layup. Meanwhile, the Govs rolled up sixteen points. 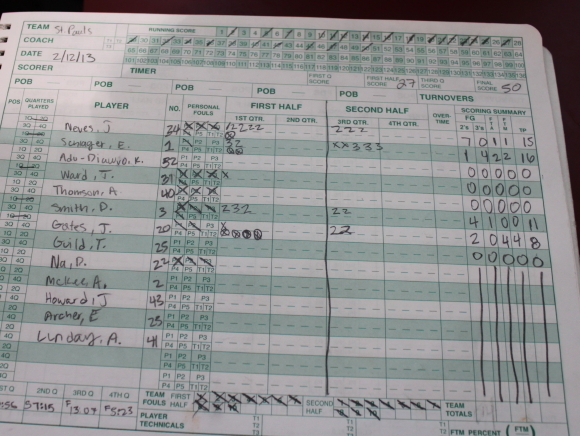 Naturally Joe Kuo had points (six) but also involved was Stephen Basden (six) and Tate Jozokos (four). 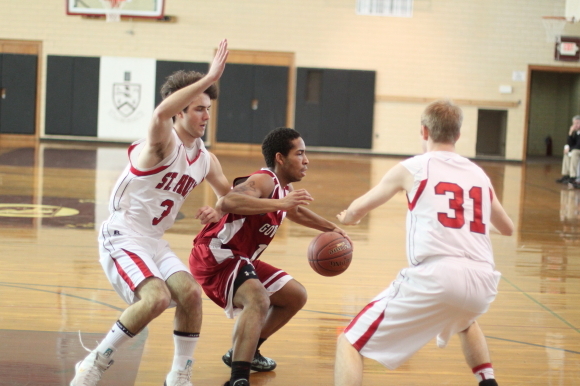 In the mix was a turnover that Stephen took in for a jam. 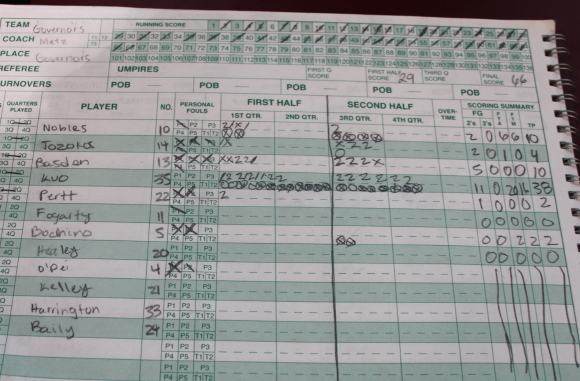 This good spell of scoring gave the Govs a, 45-29, advantage. The rest of the way both teams scored twenty-one points each but the closest Big Red could get was, 56-45, with 4:17 remaining. Joe Kuo (layup) and Cam Nobles (two free throws and a layup) provided a quick response and any suspense about the outcome departed. Joe Kuo was very impressive. His game is not of the highlight-reel variety but he was a big factor at both ends. GA was very interested in getting Joe the ball because he was productive. 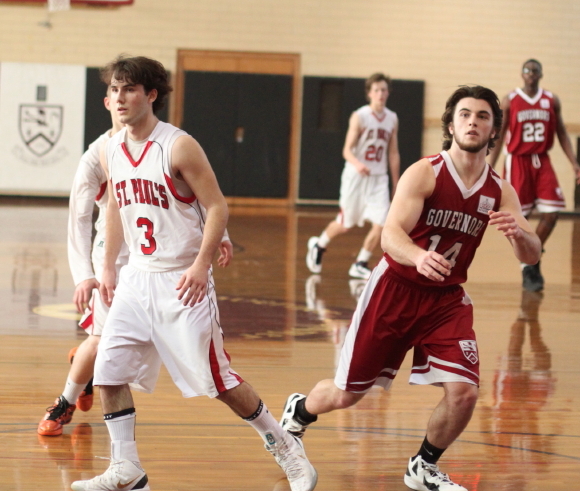 St. Paul’s had no one who could block his shot and were forced to foul him. He made sixteen-of-twenty free throws. He was also able to convert missed shots – he did it four times. Even tougher for Big Red was that often times they had Joe blocked out but he could reach over players with his size and long arms and get rebounds anyway. 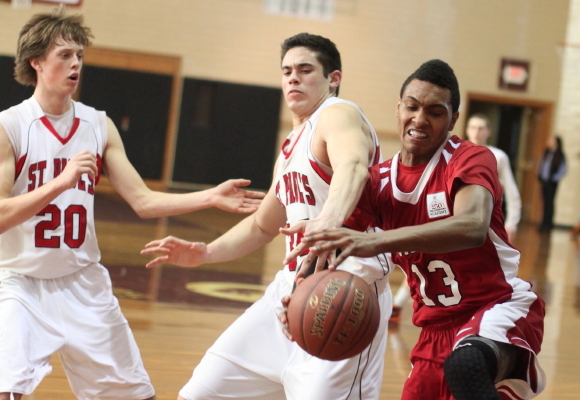 More than a few times the St. Paul’s bench yelled to referees that Joe was going over Big Red backs. Joe had nineteen points in each half. 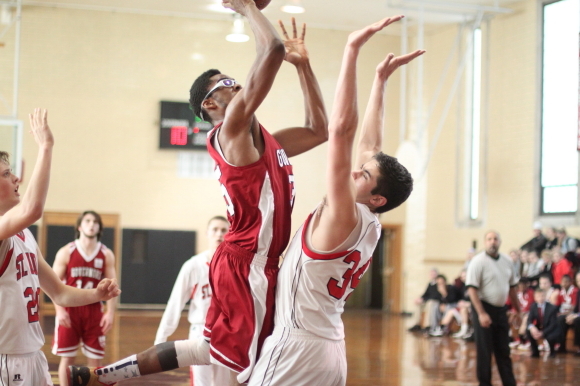 Defensively Joe had a number of blocks. Instead of trying to block shots into the stands Joe blocked them enough so that the Govs could create some quick offense. The play that raised the most excitement was a jam by fast-moving, 6-6(?) Jared Neves in which he went at and over 5-7 Charles Odei in the first half. Charles looked for a moment as if he might consider taking a charge but wisely side-stepped Jared just before a bad collision occurred. Tate Jozokos was terrific on defense for Governor’s. I thought that St. Paul’s alum John Kerry might make this one but apparently he had better things to do.